As sweet as cinnamon: Joy oh Joy! 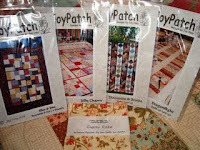 She also is including these gorgeous charm squares to get you started from the Moda Fig Tree Quilts range - "Gypsy Rose"!!! I love these fabrics!! !....Don't you? I would love to introduce you to a few newies to the blogging world......Sugarlane Quilts ........and Judes Stuff........and Beachside Dreams... Please pop over and welcome them to the wonderful blogging community.. don't forget to leave a message as this is the part that I like best and I am sure you do to.. Thanks for the promo Dawn...I'm off to visit my fellow newbies! Gracias por ser tan generosas. This is Carla from Spain (Navarra) and I`m so glad to follow your blog, I knew about you by APASIONADA POR LAS MANUALIDADES becouse I´m a member of the Club. Your works are so nice congratulations for you! I`ll thank you if you visit my blog and you give me your own opinion. OK? Hi Dawn there are some very good giveaways I am excited Hope you have A good week.